Lots of fun had on the Pitch Development night with Sarsfields children, the Pitch Committee and special guest Brian Cody..
On the same day that JJ Delaney announced his retirement from inter-county hurling, following recent retirements of Tommy Walsh, Brian Hogan, Aidan Fogarty and David Herity in previous weeks, Sarsfields pitch committee revealed the plans for a new pitch in New Inn. Thanks to the Sarsfields Pitch Committee, headed by Chairperson Michael Cooney and everyone that assisted on the night, as it was a great success. 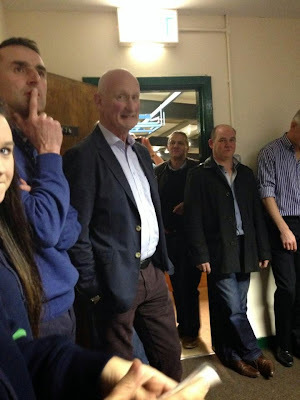 Special guest of the night, Kilkenny's Brian Cody was in top form with a fine talk of Hurling to children and adults alike on the night, and commenting on JJ Delaney's retirement, he confirmed what everyone believes that JJ is irreplaceable on the field of play. Sarsfields is well on the way to producing a top class hurling facility during 2015! Well done everyone.